The Perfect Fry Company commercial ventless fryers are the best deep fryers of their kind on the market! Foodservice facilities are places of infinite possibility. Why limit your ability to serve your customer by the amount of hood space you have? Open up your foodservice potential by adding Perfect Fry ventless technology to your operation. In 1986 Perfect Fry Company became a leading supplier to the foodservice industry with one of the most innovative and simple-to-operate countertop deep frying solutions in the world. Since then, the company has continued to build on its leadership in technology and reputation for quality. These are key reasons why foodservice operators look to The Perfect Fry Company to exceed their ever-changing foodservice needs. Designed as a professional fryer for restaurants and concessions, Perfect Fryers can expand your menu without expanding your hood system. They can produce up to 90 pounds per hour of perfectly cooked french fries, onion rings, chicken and other deep fried foods. Perfect Fryers are a great addition to your, snack bar, concession stand, convenience store or restaurant. Perfect Fry is just better. Safe and easy to operate. Preset cook times. Low start-up cost. Low operating cost. Smallest footprint in their segment. Virtually odorless. Available in semi or fully automated options. No other product can deliver a better ROI per square inch than Perfect Fry. Sits on the Countertop: saves space and installation costs, and makes renovations a breeze. Economical: you can buy two Perfect Fryers for less than the cost of installing one built-in model. They are true Commercial Fryers – cook up to three pounds at a time. It’s Ventless – built in 3-stage odorless ventilation and filtration means no expensive overhead ventilation is needed. They are Safe and Easy – with no exposure to hot oil, no greasy residue in the kitchen, and integrated fire suppression systems, you can just fill the basket and press a button. PFA Series- A fully automated frying system with features found on no other fryer in the world. 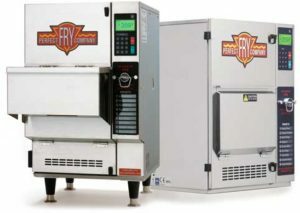 PFC Series – Computerized frying system with the smallest ventless frying footprint in the world. With a team of more than 300 commercial kitchen equipment professionals throughout the globe, Perfect Fry can help you unlock the profit potential of fried food. Send an email to [email protected] to get started.